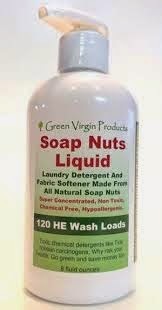 Have you heard of Soap Nuts laundry detergent?? I love trying new detergent anyway but this one is really nice. And the best part is it's natural and can be used for both washers HE and Regular. This smells really good and I am a sucker for nice smelling detergent. I would feel safe using this on a newborn's clothes before putting them on. We extract a natural soap called saponin from soap nuts and combine it with water to create a 100% non toxic laundry detergent. A small 8 oz bottle does 120 loads! It will make your clothes softer than you have ever felt them with no fabric softner. They are hypoallergenic and have a net negative carbon footprint. They also happen to save you money! I've only recently discovered SoapNuts through a few mommy blog reviews but I am anticipating trying it out in the future!